Source: Volkskrant (national Dutch newspaper). Klik hier voor de Nederlandse versie. Mark Vink’s whole world consists of exactly one room: a small room on the first floor of his house, at the end of a blind alley. Daylight is kept out by curtains. In the half-dark appears a closet, photos on the wall, a table and then a bed on the left side. There he lies the whole day, for years on end, with sunglasses and ear protection to dampen the bits of light and sound he cannot deal with. He has so little energy in his body that he can only walk to the bathroom on the other side of the hallway twice a day. After a few meters he is worn out, much worse than after the marathons he used to run. He was a triathlete, he earned a brown belt in judo, became Dutch champion in hockey, until he contracted pneumonia in 2005 and never recovered. Ever since, he has a headache, vertigo, and insomnia, but worst of all the fatigue: after minimal effort his muscles would lose all their strength and take days to recover. Only after a few years did he get a diagnosis: Chronic Fatigue Syndrome (CFS). Last year he was nominated for the John Maddox Prize, an international prize of the medical journal Nature for courageous scientists. The Netherlands has 40,000 CFS patients, and Vink (55) has the most extreme form of it. But that hasn’t stopped him from taking part in the international scientific debate. As a GP and insurance doctor he is well versed in medical literature. He reads at night, when it is dark and quiet. He uses a text-to-speech computer to write or he creates voice memos on his phone, which his parents then type out later. Two years ago he published in a medical journal for neurologists the results of the research he performed on himself, an analysis of his blood after an exercise test in which ‘exercise’ consisted of his walk to the bathroom. Last year he was nominated for the John Maddox Prize, an international prize of the medical journal Nature for courageous scientists. Last month he was among dozens of international researchers featured in a special edition of the Journal of Health Psychology. The journal was completely dedicated to the biggest research that has ever been done for a treatment for CFS, the so-called PACE Trial. That research, performed by two renowned British scientists, concluded that a majority of the patients can recover by using graded exercise and a type of behavioral therapy. The results, which were published in The Lancet in 2011, had a huge influence on the treatment guidelines and the image of the disease. ‘Chronically ill? Go outside and get active!’ the newspaper’s headlines said. Patients felt offended by the outcomes, which suggested their illness was of mental origin. Moreover, many had already tried behavioral therapy [sic] and that had only made them worse. Mark Vink is one of them, who became chronically bedridden after a physiotherapist had encouraged him to walk and bike a little more every day. ‘When an expert tells you that this is what will give you your health back, then you do what he says. I wanted nothing more than to recover. ‘A year ago, after years of legal trials, a British court judged that the study data had to be handed over to an Australian patient and since then the research has been under fire. The Journal of Health Psychology asked dozens of scientists to take a look at the methodology of the PACE study. The conclusion was heavy: ‘a textbook case of badly done science’, the chief editor wrote in his comments. ‘The results are unreliable at best, and in the worst case manipulated to achieve better results. And still, there is nobody who understands the disease. ‘Vink was approached as well. He studied the patient data, analysed the results, and worked night after night on an analysis in which he debunks the research. “We are all tired now and then. You are overreacting. There is nothing wrong with you except perhaps that you are not motivated to recover.” Over the last ten years Vink has heard every variation of this from doctors. But the dividing lines are no longer only between patients and doctors; the disease now also divides the scientific world. On one side are the doctors and psychiatrists who defend the PACE trial and are convinced that their treatment works. On the other side stands a growing group of statisticians, psychologists, biochemists and epidemiologists who wonder how such ‘incredibly amateuristic research’ could have ended up in one of the best journals in the world. What is the most important critique on the PACE trial? ‘The researchers did not perform double-blind research. The patients who received therapy knew that they did and what it was for. The researchers checked for recovery by letting patients fill in questionnaires. Those showed a difference between patients who received therapy and the control group, in favor of the behavioral and exercise therapy. ‘But during the study they had sent newsletters around filled with patients praising the therapy and sharing how it had helped them. This would have influenced the results. The researchers also relaxed the scores set for recovery, and eased the criteria to be included into the study. This created an overlap between illness and recovery: 13 percent of the participants were ill enough to qualify for the study, but at the same time, by adjusting the scores, were already considered partly recovered before the therapy had even begun. ‘The objective measurements that were used, the step test and the six-minute-walking test, did not show any significant results between the two groups, but this was ignored by the scientists. When the patients had to fill in questionnaires two years after the trial, there was no difference anymore between the two groups. This means that patients, after having received the therapy, were still ill enough to attend the study again. The critique of the study has received a lot of international attention. Do you notice any change? ‘I notice a small shift. There are still many doctors and scientists who think that there is nothing wrong with us, but that is changing. The CDC, the American health service, recently removed information about behavioral therapy and exercise therapy from their website. Now it states that there is no cure for the disease. Does something change for you personally? ‘That is going to take a while. I have received reactions from all over the whole world to my article from last month. Patients are so happy that people are finally opening up. Me being a patient and a doctor gives my story extra weight, apparently. I used to never be ill, I had a fun life, a good job, I played a lot of sports. What reason would I have to fake this all? ‘As a GP I learned that patients who never come to the GP’s practise fix their own problems. And if they did come in one day, there was really something wrong. Still, this was not the attitude I encountered when I became a patient myself. I used to never be ill, I had a fun life, a good job, I played a lot of sports. What reason would I have to fake this all? What were the results of your own blood research? ‘Quite quickly after the onset of the disease I felt like my legs were exploding when I walked a short distance, a huge acidification. I wanted to know if there was a biological cause for that. That is why I drew blood from my fingertip a few times, once before I stepped out of bed and walked to the bathroom, and again when I came back, after waiting for 5 minutes and again after half an hour. The loss of power in my muscles appears to be caused by severe problems with the energy production in my cells. ‘That is the blood I had tested. That showed that after minimal exercise, for an extended period of time I have an insane amount of lactic acid in my blood, an amount much higher than a top performing athlete after extreme exercise. The loss of power in my muscles appears to be caused by severe problems with the energy production in my cells. I am not fatigued. That is why I would rather not call it ‘chronic fatigue syndrome’, but instead ME (myalgic encephalomyelitis, the other name for this disease, – added by the editor of the newspaper -). Many patients do not experience extreme fatigue. Doesn’t a day feel endless to you? ‘My day and night rhythm is reversed. I barely sleep at night, and during the day only now and then. Indeed I cannot watch television, listen to the radio, or read books. I read texts on my phone, at night, on a dark screen. During the day I cannot do anything other than lie down and think. A loud voice, light that shines into my room, a door that closes, all these things are not even noticed by most people, but they irritate my brain. ‘At the start I had a major headache for nine months. When I have negative thoughts, I think back about that. Then I could not do anything at all, and now I can, even if it is for just a few hours a night. Then, I have to wait for the next night before I can continue. What makes life worthwhile for you? 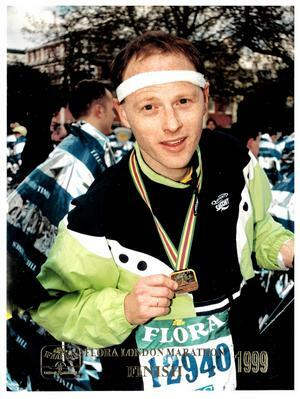 Mark Vink before he got ill, at the finish of a marathon in London. Being able to publish an article now and then. It takes me a lot of time, I cannot sit behind my desk on my laptop, but instead I have a very simple phone with a voice recording program and it is remarkable what you can do with that. I have two children, whom I talk to a lot and who bring the outside world into my bedroom. ‘Sports were always my life and I am still very fond of them. Now I can only follow them on Twitter, those are just short messages, so little stimulants. I am a huge fan of Formula-1 so when Max Verstappen (Dutch Formula-1 racer, – added by translator -) I really look forward to that. I would love to be able to attend a race again. But, when I think all day about all the things I cannot do anymore, then I lose my motivation to continue. ‘This month two major research studies in Norway will be completed; CFS patients around the world are waiting for the results. Oncologists coincidentally discovered that two existing cancer drugs helped patients with CFS and over the last few years they have been testing the drug on a larger group of patients. Mark Vink dreams in his dark room about a drug that can give him his life back. The world outside his house is so close and yet so far away. ‘I would enjoy to see and feel what weather it is. ‘He shows a picture from long ago, taken just before the finish line of a marathon in London. A few years later he fell ill. ‘I realized I might never have a normal life again. I don’t have a choice. But I would give so much to get a part of my health back. There are more and more clues indicating that the immune system plays a crucial role in the development of CFS. For three quarters of all CFS patients the disease starts after a common infection, for example influenza. Scientists suspect that cytokines, which are substances created by immune cells, are the cause. Cytokines activate inflammation in the body. That is okay when intruders have to be combatted, as is the case with influenza, however it leads to unnecessary symptoms when the intruders are not or no longer present, which is the case in CFS. American researchers from Stanford University concluded this summer in the journal PNAS that the severity of the disease in CFS patients correlates with the activity of 17 different cytokines. Translated with by Aaron Caine, Marcie Quaroni and Al. Previous Post Praised from the dark. Next Post Mike Harley is running for our lives in Amsterdam.